Changing your GST Accounting basis at any time, be it post conversion or some time in the future, will have an impact on the GST history. For example, with moving from Cash to Accrual all the transactions once flagged at Payment/Receipt for BAS reporting will now be ignored and reorganised to have GST recognised at invoice date. Past GST remittances will not longer match and balance. There will be no impact moving forward. Allows reporting for GST to be either CASH or ACCRUAL irrespective of how the company has been set up. 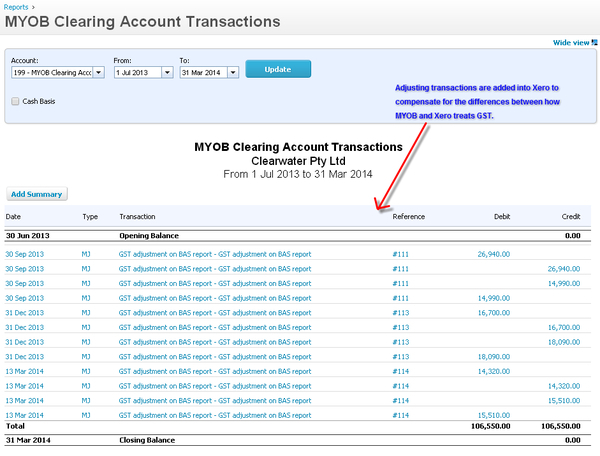 Unless the BAS is being produced from MYOB there is no impact to the accounts or reports using either method. Xero is more obvious with reporting and transaction treatment, so on conversion it is more noticeable if the setup was incorrect in MYOB. Possible Implications are if the accounting method is changed either way then past BAS reconciliations will no longer be valid or in balance. 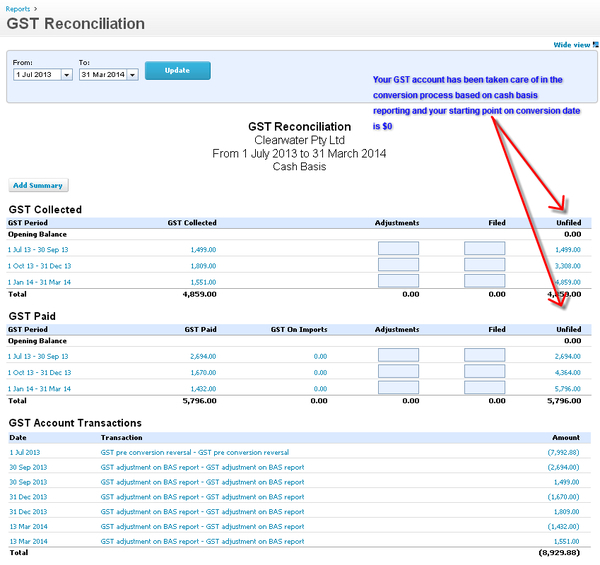 There will be now un-filed amounts in the GST Reconciliation Report. Entries will need to be made to compensate for the reorganisation of the GST period allocations. 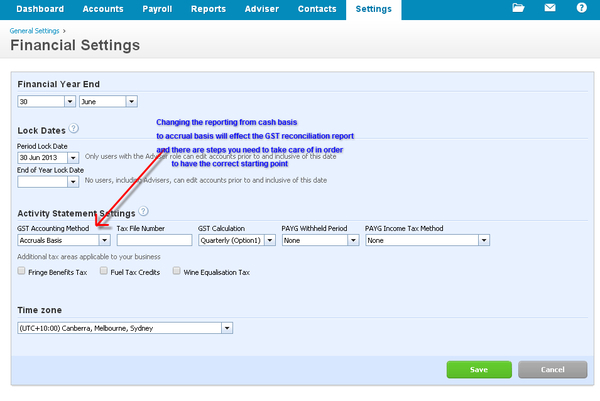 Our conversions will replicate the MYOB accounting method, if a change is required then we recommend that you make this change to your MYOB file prior to uploading. Otherwise we can provide bookkeeping assistance post conversion. At Jet Convert we have developed a methodology for checking and treating GST tax components when bringing transactions across from MYOB to Xero. 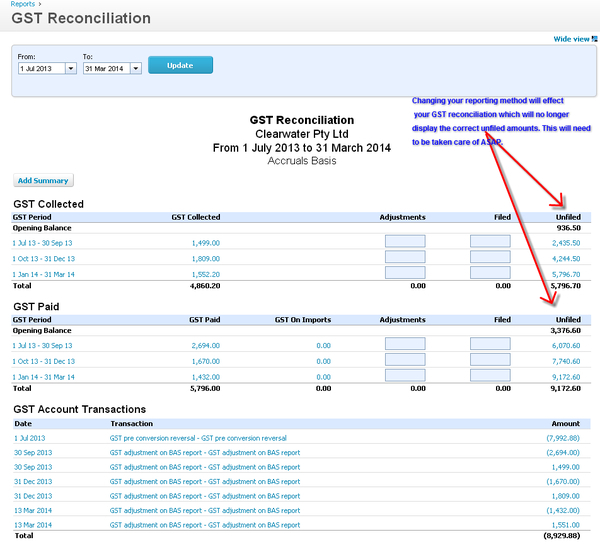 To compensate for the differences between MYOB and Xero GST treatment, we enter adjusting transactions and lines using our conversion Clearing Accounts during the conversion process. If you do a conversion with us transactions should not be added to or removed from these accounts without first checking as this may have impact on Conversion Balances. As you can see GST treatments differences between MYOB and Xero can cause data disruption and potential confusion on the part of your client. More information on GST treatment differences between MYOB and Xero can be found in our blog post GST Myob Vs Xero and the Reality. Warning, unless you understand the full accounting implication of the above steps there is a very high chance that the integrity of the data may be impacted by changes you make in the Xero org. This may not surface until sometime later and could result in major rework required.